Marcus Agrippa constructed the original Pantheon in 27 BC, as a temple to all of the gods of Rome on the site known as the Campus Maritius. The Pantheon is truly one of the greatest architectural master pieces in Roman history. It has long been considered to be a marvel of design and execution, even by the standards of the 20th century. At the beginning of 117 AD, during the reign of Hadrian, it was decided to replace the edifice with a new and improved structure. Under the guidance of Hadrian himself, the new Pantheon construction continued between 118 to 125 AD, on the same site as that of Agrippa’s old structure. 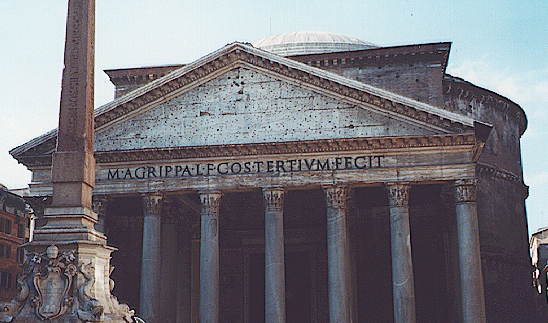 Hadrian, unlike so many other Emperors, refused to claim any credit for the Pantheon, preferring instead to have an inscription carved on the porch giving credit to Marcus Agrippa, which still survives today. Additional repairs and minor adjustments were made by Emperors Septimius Severus andCaracalla in the early 3rd century AD. The cupola’s diameter is equal in measurement to its height from the floor, thus forming half of a perfect sphere. The overall design of the Pantheon reflects the few sources of light that enter the building. The rotunda or dome was an absolute marvel being the largest constructed by ancient methods. The rotunda’s construction was made of solid concrete, a material invented by the Romans – not modern man. The dome was originally covered with drawings, each being highlighted at various times of the day as the sun passed over thereby shifting the light source based upon the principle of the sun dial. Visitors entering the building immediately find their eyes drawn upward to the circular aperture at the crown of the dome providing a spectacular sight indeed. The Pantheon managed to survive only because it was perfectly suited to serve as a Christian church. In 609 AD, it was given to Pope Boniface IV as a gift from a Byzantine Emperor. From 609 AD onward, the Pantheon was transformed into the Church of Santa Maria dei Martiri. 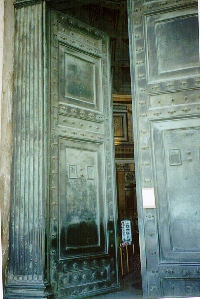 The bronze doors, which still function today, are original to the building. They are similar in design to those constructed by Julius Caesar for the Curia, which are to be found at the Church of St Latern in Rome. The bronze doors of the Pantheon are spectacular and provide a true glimpse of the grandure that was once Rome of ancient times. A visit to Rome is certainly not complete without a visit to the Pantheon of Marcus Agrippa.